Joseph Phelps beginnings were in Napa Valley in 1973 where they continue to produce wines of distinction. 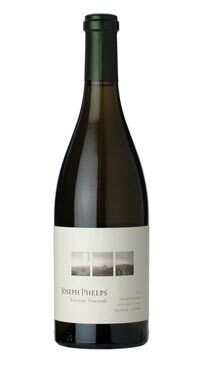 In the mid 1990’s he headed further west to the town of Freestone on Sonoma Coast to plant Pinot Noir and Chardonnay. At the time few wineries existed there and Joe saw the potential for these varietals to produce world class wines in this cool foggy region just twelve kilometers from the Pacific Ocean. Made from 100% estate-grown Chardonnay from Freestone Vineyards. To preserve fruit integrity and freshness, the harvest happens at night, under cooler conditions and the grapes are whole cluster pressed and go directly to barrel for fermentation. Barrels are stirred as necessary during malolactic fermentation and the wine rests for thirteen months in 33% new and 67% two to three year old French oak puncheons and barrels. The result is a focused and opulent wine. This wine is bright and fresh; it envelopes the senses with lemon zest, green apple and jasmine aromas. A richly textured mouth feel with inviting citrus notes, stone fruit and lemon custard throughout the palate, followed by crushed oyster shell minerality and a subtle toasted brioche finish.